DESCRIPTION: Sorbidon Hydrate is a pleasant scented, water-in-oil cream used for softening and restoring moisture to dry, cracked or calloused skin. It is especially helpful for the skin of the feet and hands. The oils in Sorbidon Hydrate will restore the skin’s smooth, soft and youthful appearance. For diabetic dry skin, heel fissures, chafed skin caused by sun or windburn. For sports applications, Sorbidon Hydrate will help to lubricate and hydrate the feet to cut down friction and help prevent blisters. 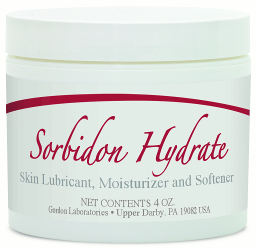 PHARMACOLOGY: Sorbidon Hydrate is unique among creams in that it leaves a microscopic film on the skin which helps alleviate various problematic skin conditions. The Castor Oil benefits deep skin tissue and locks in moisture.